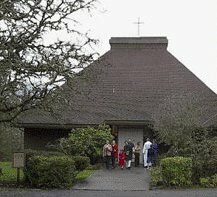 The Church of the Resurrection began its existence as a mission congregation sponsored by St. Mary’s Episcopal Church, Eugene. Those who were interested in forming a new congregation met for the first time on March 23, 1964. The following month the first service was held in the Spencer Butte Middle School cafeteria and services continued to be held there until the present building was ready for use in June, 1968. Later, Resurrection became a mission congregation of the Diocese of Oregon. In November, 2002, the parish applied for and was granted the status of parish by the annual convention of the Diocese of Oregon. Local architect DeNorval Unthank designed the worship space with a high asymmetrical sloping roof. Although it may not look like a traditional church building from the outside, the interior is very worshipful. The congregation gathers around three sides of the altar. A large wooden cross hangs over the altar and the stained glass window of abstract design is the focal point of the eastern wall, instilling a sense of transcendence for the worshiping community. In 1982, classrooms, a meeting room and a kitchen were added to the south end of the building, supplementing the original facilities of the parish hall on the lower level.